You can run the software on Mac OS X, Windows or Linux operating systems. TheHarmony Xsheet opens, displaying the Welcome Screen. 2. Enter your User Name in the user name field. Your project manager or system administrator should already have created a user name for you. 4. Select an Environment (for example, this could be the name of a cartoon series), the name of the Job (for example, the name or number of an episode in that series) and then the Scene (for example, a specific scene in that particular episode). 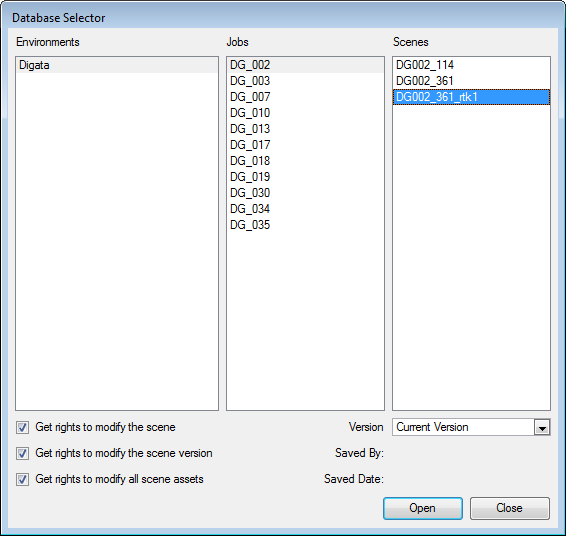 ‣ Get rights to modify the scene: Allows the user to modify the selected version of the scene and have access to the version manager during the opened session. ‣ Get rights to modify the scene version: Allows the user to modify the currently selected scene version but locks access to the version manager during the opened session. ‣ Get rights to modify all scene assets: Automatically gets all the edit rights for the selected version of the scene. This option is only recommended if you are certain that the selected scene can not be opened for editing by several users at the same time. Large studios should avoid this option. If you opened a scene as read only, but realize that you will need to modify it, you can easily acquire the necessary rights without closing and reloading the scene. 1. Select File > Rights to Modify Scene. Note that it is not possible to acquire the rights to modify the scene assets once the scene is loaded. This process is done during the initial loading process of the scene. 2. From the Version drop-down menu, select the version you wish to work on. 3. The Saved By and Saved Date fields display the user who was the last to save the selected scene and the date of the last save. 4. Click on the Open button.